A homicidal maniac has escaped from a mental institution. On Halloween night, the killer returns to his home town to wreak havoc! You are babysitting for a family in a large, two story house. Somehow the vengeful murderer has gotten inside! Can you protect the children and yourself from the fury of his knife? You control the babysitter character, and, at certain times, the child characters. As you move through the sixteen rooms of the two story house, avoid the killer when he appears. He will attempt to stab you and the children, so look for the knife with which to defend yourself. Jack-o’-lantern icons at the top of the screen tell you how many lives you have left. Play the game at the Internet Archive. Odd that they seem to go out of their way to not use “Michael Myers,” even though the movie name and poster are used. “He” and “Boogeyman” instead. Some kind of convoluted copyright/trademark thing, maybe? 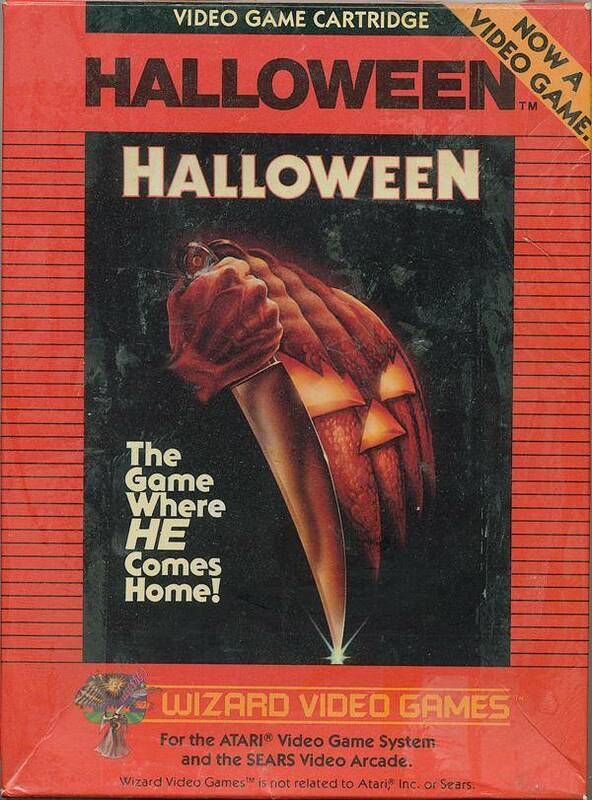 There’s no mention of any characters in the movie anywhere, and the final copies of the game box featured a plain black box with “Halloween” written on front. Looks like Wizard just took the official poster/logo and ran with it. And I forgot to mention that you can play the game at the Internet Archive. Will update post. Although I just noticed a “TM” on the back of the box but not on the front. Good call. I see it. the reason probably why you don’t see them mention the Michael Myers name is because back then he was simple called The Shape or The boogeyman. Even in the movie credits at the end of the movie it shows The Shape played by Nick Castle. It wasn’t till later when every one just started calling him Michael Myers. 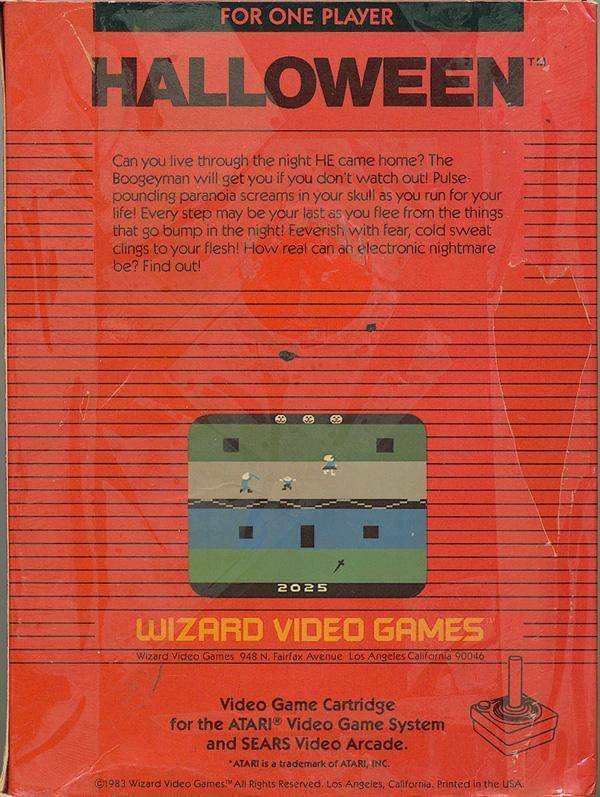 But Myers is mentioned by name in the film, and the game was released in 1983, so it was well known by that point. And there’s nothing in the fine print (on box, cart, or instructions) about Halloween being a licensed trademark of Warner Bros. Pictures, etc. 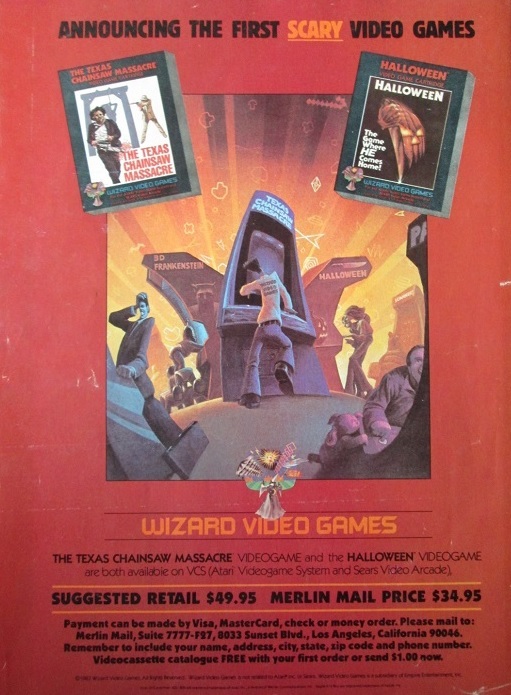 Funnily, Atari IS credited with trademark. Wow, I thought this was a joke at first. How have I never seen this before? !